Leaning on the Everlasting Arms: What do YOU do when the electricity goes off? The electricity goes off in Belize quite often. Sometimes it is for a few minutes and other times it is for 6 to 8 hours. Last week the electricity went off at 7 PM just after we had finished eating. It was total darkness. 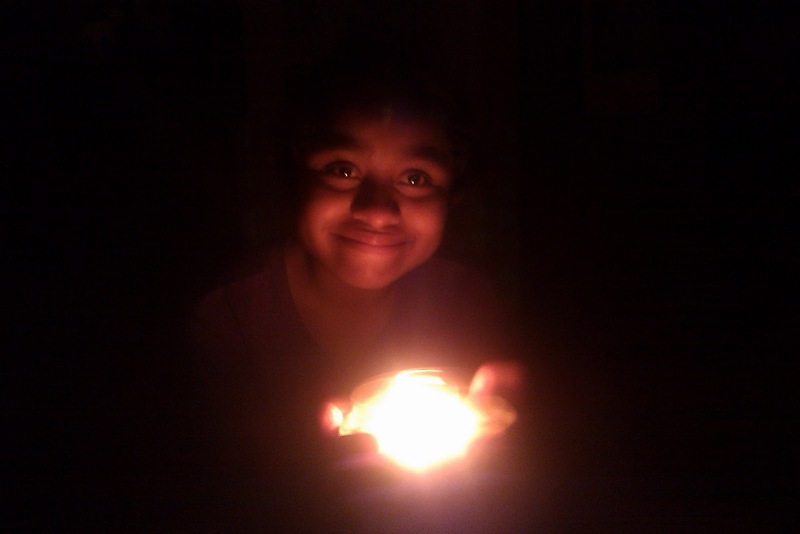 Sulmi and I felt our way to the bathroom where I keep flashlights and candles on the shelf. While I got busy lighting candles... Sulmi did the dishes "by flashlight". The picture doesn't really portray the moment because the flash in my camera made it look bright. Imagine this with just the light of that little blue flashlight under her chin. I laughed thinking...who does dishes by flashlight? Later we tried to sign in the darkness by the light of the candles. Sulmi liked the smell of this "Christmas Cookie" candle and held it up to her nose. It lit her face in the darkness. About ten minutes later the power came back on. I thought, ah shucks...this was fun :-) Sulmi thought I was weird and walked into the living room to watch TV. Hmmmm... I wish they would cut the power in the evening more often.